Before we start this here column, can we have a moment? A moment of silence for Eric, my Winner Pick™? While I thought the old Lesu might pull off a blindside this week, I really believed Ron would be the one heading home. Unfortunately, Eric took the fall and, once again, my Winner Pick™ did not go far. Now, Eric could come back from Extinction, but he ain’t winning. Let’s be honest. Eric is now staying at Extinction, but I don’t think we really want to analyze the strategy behind the move that eliminated him for three reasons. First, we’re never really given a glimpse into strategy this season. Second, it was a super dumb move for the Kama 6 to split this early; they should have waited at least one more vote. And, third, what went on with Devens is far more interesting. This week, as we turn to theory, let’s delve into some economics. Now, most of us probably think of economics as the study of money, or capital. But since really the days of Adam Smith, a small branch of microeconomics deals with what we call behavioral economics. For example, you may have heard of rational choice theory, which essentially argues we can understand the way society operates by examining how individuals make choices … since we all make choices that benefit us. Really, when we’re talking about behavioral economics, we’re melding economics and psychology, two social science disciplines. Behavioral economics helps us understand the psychology behind how people make economic decisions. 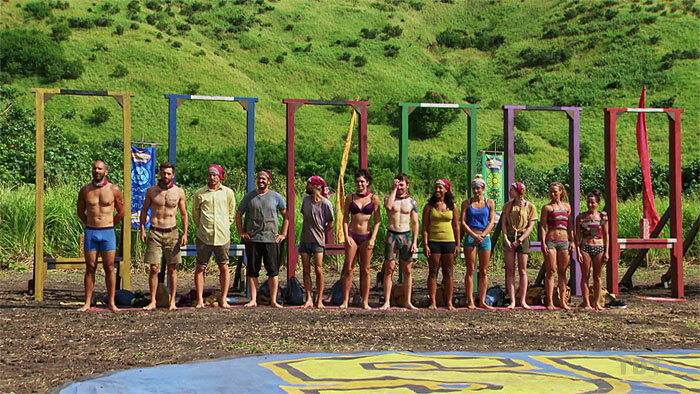 And what’s Survivor but a series of economic decisions? So this week, we’re going to talk about the theory of sunk cost, or the sunk cost fallacy. Most of us have heard the term “sunk cost” before, but do we know how it drives decisions? Let’s take sports for example since teams make these mistakes all the time. So you’re the Angels and you pay Albert Pujols a bajillion dollars a year to produce at a rate way worse than average. In fact, over the last couple seasons, he’s been worth negative value. But the Angels refuse to cut him or stop playing him because they’re on the hook for so much money. That’s an example of a bad decision. Albert Pujols is a sunk cost; the Angels need to pay him regardless. The team continues playing him since they’re paying him, but it would make more sense to cut him and get more production out of a minimum-salary player. A sunk cost, then, is something that’s already been paid for is not giving us any value, but we continue to use it or let it guide decision-making simply because we paid for it. Another example? Most things we buy are for convenience. If I buy a vacuum cleaner for $1,000, bring it home and it after a year, it stops working well, I might keep using it because I paid so damn much for it. Yet, I’m wasting a lot of my time vacuuming with the crappy thing. I could go buy another vacuum and save a whole lot of time. That expensive vacuum is a sunk cost. What does this have to do with Survivor and Devens? Well, Devens had a choice this episode: He could either be on the bottom of the Kama alliance or flip back to Lesu. I would argue this is an economic decision and one must put the past in the past and not let it affect future behavior (too much). Now, of course what happens in the past is contextual information that someone should use when making future decisions, but to let something that already happened completely dictate future decisions is short sighted. Let the sunk cost go. In his conversation with Wardog, Devens refused to listen to reason because of things that already happened. He couldn’t see how his best decision moving forward was to get past previous votes and understand the best decision for him (and the rest of Lesu) was to get the band back together. Treat the past as a sunk cost. 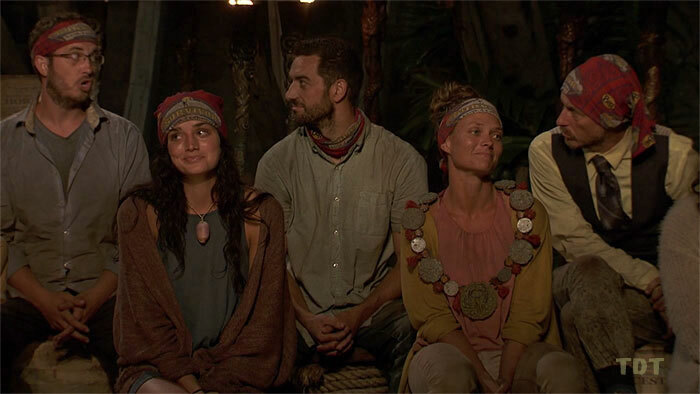 And that’s the key with Survivor: If we treat every decision as an economic one, a decision meant to get someone closer to $1 million, then we have to think of every decision as a singular one, informed by the past but always an independent decision. Devens didn’t do that this week and I wonder if it’s his game. Victoria: I still think she’s looking the best of all the original Kama members. She knew the play for Eric didn’t make the most sense, but she stayed flexible and went with her closest allies. To me, Victoria and her beanie look like the favorite to win this thing. Devens: Poor Devens. I still think he gets back with other Lesu members, but it might be too late for him to actually win. I truly didn’t expect him to play the way he did this week. It did not seem, to me, at all like a winning strategy. Even if we can quibble with the idea of reuniting with Lesu, he just can’t blankly tell Wardog — and thus the others — that he won’t work with them. Not good. Julie: While Julie keeps earning more screen time, we still don’t know what kind of toys she makes. Now, I’m guessing a quick search of the World Wide Web would tell me, but that’s creepy, so I won’t do that. Instead, I continue using this column to plead: Julie, what kind of toys? Oh, and not a good week for Julie since she and Ron were the only Kamas on the wrong side of the vote. Well, at least ones still in the game. Gavin: One of the many, many problems with the edit this season is that we have no idea why Gavin allied with Julia and Victoria. 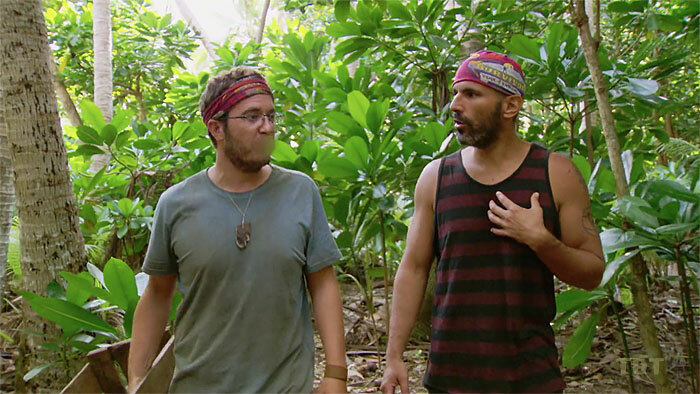 Everything we had seen so far suggested Gavin and Eric had a tight alliance. Well, clearly they didn’t. Ron: Oh the Puppet Master. If I were to ever, ever play Survivor, I would never brag about myself in a confessional. You just know producers will only use said brags to make you look bad — unless you’re Boston Rob or Richard Hatch, of course. Therefore, I believe, nothing good can come from calling yourself the Puppet Master. Ron should know that. Julia: To be clear, there is no way Julia was winning by staying Kama strong. So, even though I hate the timing of last week’s move, it still had to be done at some point. Here’s my question, though: What did her conversation with Eric really accomplish? OK, so he looked a little sketchy not making eye contact. But, even if his plan didn’t include using David and Devens for taking out some members of Kama, he was always going to push back on getting rid of one of them. Bad strategy to not keep them through a couple more votes. David: In this episode, David moved a step closer to becoming a pilot. I still believe he stands the best chance of winning amongst the returnees. Kelley: One of the other huge flaws of this season is we’ve seen nobody strategizing about Edge of Extinction. The castaways must be taking Extinction into consideration when voting, but yet we don’t see that. What I also wonder is if there’s no Extinction, does Kelley and/or Lauren play an idol this week? I mean, we know Julia and Gavin must have told Lesu that Eric was the target, but are Kelley and Lauren confident enough in the new players to trust them if Extinction didn’t exist? Aurora: This, to me, is the person who had the best week. Now, we’ll get to Wardog in a second, but Aurora won a challenge and emerged in a great swing spot ... with an extra vote. Nobody will be gunning for Aurora anytime soon, I don’t think, and if she continues to do well in challenges, she could emerge as a potential winner. Of course, producers haven’t shown us any of her strategy. Lauren: Maybe someone reading this can help me: Does anyone remember a weirder edit than the one Lauren is receiving? We’ve seen a montage of her being lazy and many of her confessions feature whining. Yet, she found an idol, is destroying challenges and seems to be making decent connections. I just don’t get it. Help? The Wardog: What a week for the Wardog. At least according to editing, Wardog seemed to plant the seeds of Kama’s destruction. Even when Wardog looks bad in other areas such as challenges, Wardog always seems to know what’s happening in the game better than anyone else. This week was masterful. I still don’t think he can win, but this was a Big Move™.